The Tickets tool has a Cumulative Flow Diagram (CFD) under the Metrics subtab. The Cumulative Flow Diagram (CFD) is an extremely valuable management report available as part of the Assembla Tickets tool. It tells you a lot about your development process. It shows the number of tickets in each status column, over time. You can see work in progress, velocity, and bottlenecks. This report shows the shape of your iteration, Scrumban sprint, or Continuous/Kanban WIP. It requires a current milestone. Click on the Metrics sub-tab. Result - A graph is generated that shows the number of Tickets or Ticket Estimate in each of your status categories, for the milestone and the time period you have selected. What is on the Graph? When you look closely at the graph, you will see that it provides a snapshot of your tickets on a given date (how many with status “New,” “In-Progress,” “Test,” etc.). When you move your cursor along the top boundary of any layer, a popup box will list the ticket count or ticket estimate in that category on each date. 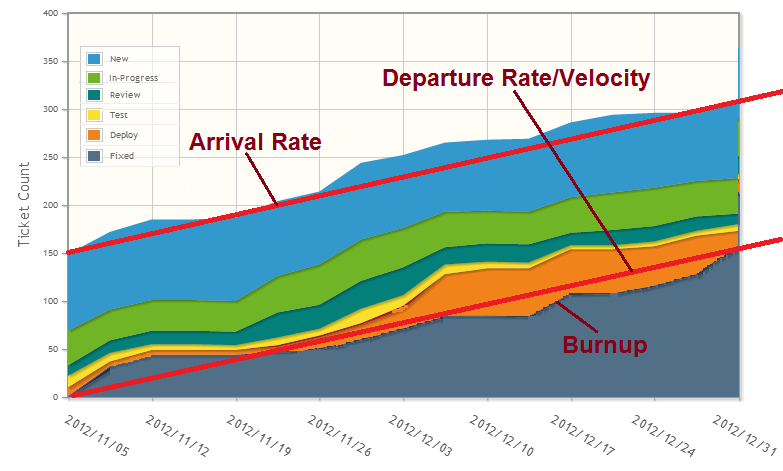 The Graph shows the Departure Rate and the Arrival rate of your space Milestone. The bottom layer on the CFD (usually labeled “Fixed,” or “Done” or “Completed”) shows the number of finished tickets at different times. The upper boundary of the bottom layer shows the cumulative number of tickets completed or “burned up” in the iteration or milestone. The slope of this line on the graph is the “departure rate”; that is, the average number of tickets completed per time period. In Kanban and other flow process this is usually called the “velocity”. Either way, it is a measure of throughput and productivity. The time needed to complete the current milestone. The time and resources needed to complete future projects with a given number of tickets. These estimates are not going to be exact, because different tickets require different amounts of work. But over time they should average out and let you make rough projections. The upper boundary of the top layer on the CFD represents new tickets arriving into the milestone, so the slope of that line is the “Arrival rate”. Identifying and eliminating process bottlenecks is a critical element of continuous improvement. CFD gives a quick picture of the status of your project such as velocity, WIP and ticket cycle times. It provides a great way to see if your ticket cycle times are improving – or to give you an early warning if they are deteriorating. Cycle times are indicated by the horizontal lines in the diagram. These represent the average interval between starting work and completing a ticket. For example, in the diagram below we not only can see that the cycle time has been growing but we can also look at the individual layers and get an idea of the underlying problems. Cumulative Flow Diagram (CFD) also helps you to spot any scope creep. WIP and cycle times are functions of the relationship between the arrival rate and the departure rate. 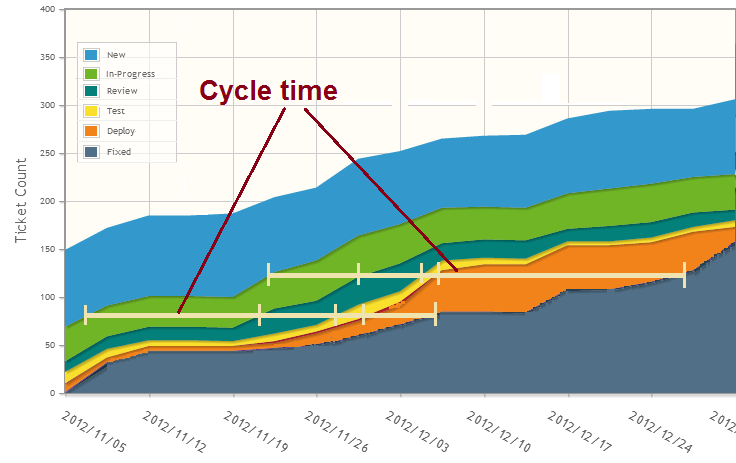 If more tickets are flowing in than flowing out, then both WIP and cycle times will increase. That tends to slow down release cycles and hurt productivity. The CFD helps you see how those factors are interacting. For example, if you have a steady departure rate, but you see the arrival rate increasing, then you might want to consider slowing the rate that you accept new tickets for the milestone. Forcing more tickets into the mix won’t make any more work come out the other end. In fact, increasing WIP and cycle times will probably reduce the number of tickets delivered in a given time period.